This listing expired on March 31, 2014. Please contact stephane.pradines@aku.edu for any updated information. Our research project concerns navigation, trade and the beginnings of Islam in the Western Indian Ocean: mainly what we call the Swahili Coast. After working from 1999 to 2003 on the site of Gedi in Kenya (Pradines, 2010) and from 2004 to 2006 at two sites Songo Mnara and Sanje ya Kati, in the region of Kilwa in Tanzania (Pradines, 2005 and 2009), we have focused our attention on an ancient site on the outskirts of the Swahili area: the Comoros archipelago. The site of Dembeni is located on the island of Mayotte in the Comoros archipelago. During our first survey in 2009, we collected several fragments of Abbasid glazed turquoise jars (called sassanido-Islamic). These ceramics are dated between the 9th and 10th centuries. The biggest problem with the site at Dembeni is that it is a very large site. However the origin and quantity of imported objects discovered on the surface are exceptional. This qualitative judgment does not apply only to the Dembeni place in the history of Mayotte and the Comoros, but in the history of the Western Indian Ocean and the Swahili coast. The site, called Dembeni, is one of the largest and richest archaeological sites in all East Africa. Its apogee in the 9th-12th centuries was a period of intensive trade, first with the Abbasids in the Persian Gulf then with the Fatimid Caliphate in Egypt. Dembeni delivered an archaeological material of unprecedented wealth for the time, with a large amount of Chinese and Persian ceramics, as well as glassware from all over the Islamic world. This accumulation of richness was not made by chance, and during many years, archaeologists were seeking the origin of the wealth of this site. The first excavations in Dembeni started on 23 July and ended 25 August 2013. During this mission, the team uncovered large quantities of fragments of rock crystal in the form of chips and flakes of different sizes. Arab & Persian written sources on trade in the Indian Ocean during the medieval period mention rock crystal from the islands of East Africa, the quantities of rock crystal uncovered during the excavation leads us to believe that the mineral was imported to Mayotte from Madagascar in draft form, then resized and exported to the Middle East – mainly Iran and Egypt. It is now possible explain the wealth of the site and to be more precise than the Arab written sources on trade in the Indian Ocean during the medieval period and to pinpoint the exact international trade route. This rock crystal arrived in the capital cities of Baghdad and Cairo via Persian merchants who travelled with Omani boats and sailors. They travelled for months to East Africa and they were stationed in many Swahili ports like Mombasa, Zanzibar and Kilwa. Then they pushed further south towards the coast of Mozambique in order to get gold, or to the southeast to reach the Comoros. 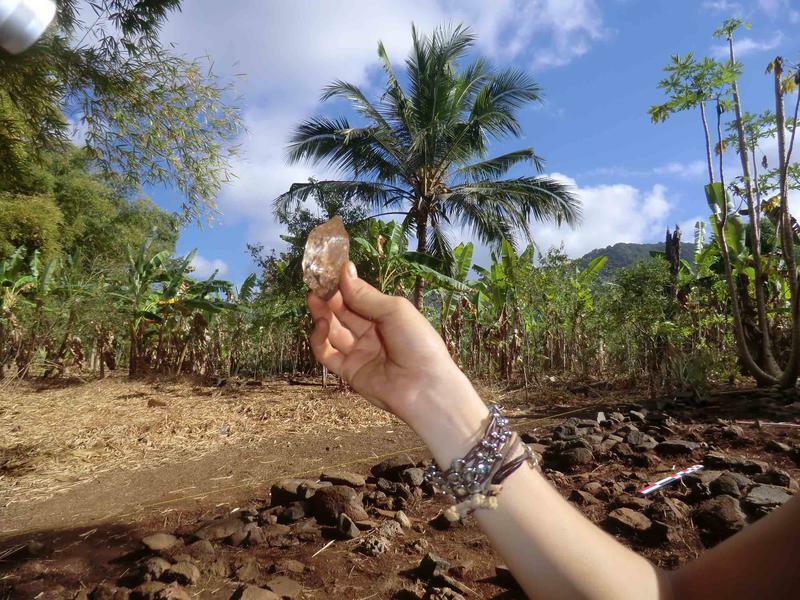 On arrival on the island of Mayotte, the merchants exchanged ceramics and other items for the precious rock crystal, which only the best parts were retained. Between the 11th and 12th century, the rock crystal was discharged in Aden, Yemen. Archives of Jewish merchants and Persian travelers tell us that the products were then transshipped and forwarded to the Egyptian ports of Aydhab and Quseir on the Red Sea. These valuable goods were then loaded to the Nile Valley and transferred by felucca to Cairo and Alexandria, the rock crystal was then shaped by skilled craftsmen. Rock crystal objects – mainly ewers and bottles – adorn the great museums in the world, like the Victoria and Albert Museum in London, the Louvre in Paris or the Metropolitan Museum in New York. Some objects were incorporated into the treasures of Christian kingdoms like in Saint Mark’s Basilica in Venice and in the King’s Abbey of Saint-Denis near Paris. I believe the rock crystal found in Mayotte is related to these prestigious objects. Most striking is the complexity of international trade in the Indian Ocean in the early Middle Age – a ‘globalization’ before its time. The next step is for the excavated rock crystal to undergo mineral analysis to determine the sample’s origin and its relationship to the objects in these great museums. I brought some samples to London, with an exportation agreement from the French authorities. On the field, the next excavation in August 2014 will be centred on that topic of the rock crystal. We will try to find the debitage area and other waste material that may throw light upon the processing of rock crystal at the site, and perhaps even the chance to find tools and working areas. 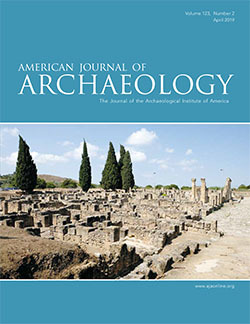 Another topic of the next season will be to identify the necropolis and the funerary area of the site. 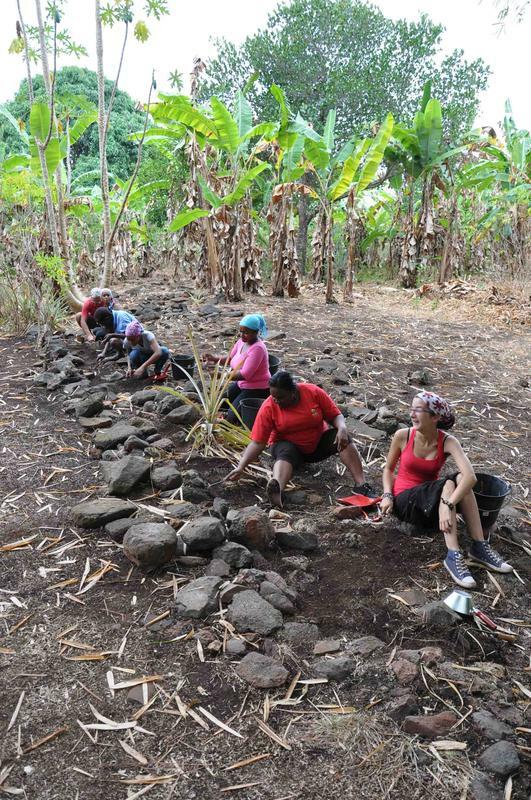 In order to see if the people of Dembeni followed the Islamic practises, it will be interesting to see for example if they buried their death with objects as it was the case in Vohémar in Madagascar, a site who was connected to Dembeni. HORTON, M. 1996. Shanga. 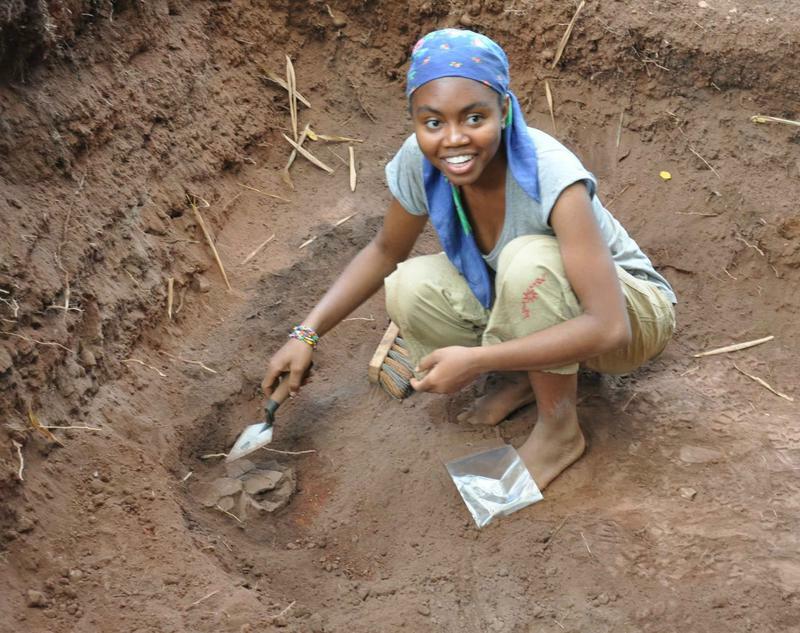 The archaeology of a Muslim trading community on the coast of East Africa. Nairobi: British Institute in Eastern Africa. HORTON, M. & J. MIDDLETON. 2000. The Swahili. Oxford: Blackwell. PRADINES, S. 2004. "Fortifications et urbanisation en Afrique orientale," Cambridge Monographs in African Archaeology 58, British Archaeological Reports. Oxford: Archaeopress. PRADINES, S. 2010. Gedi, une cité portuaire swahilie. Islam médiéval en Afrique orientale (Monographies d’archéologie islamique). Cairo: Institut Français d’Archéologie Orientale. WRIGHT, H. 1984. "Early Seafarers of the Comoro Islands: the Dembeni Phase of the IXth-Xth centuries AD." Azania 19: 13-39.